These two incredible resources that cull postal rate data from a variety of government resources, most notably the Postal Bulletin and Postal Laws & Regulations amongst others, present many different types of U.S. rate information in primarily tabular form. 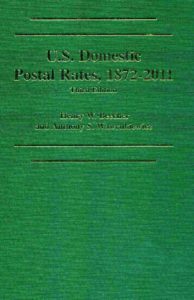 In the third edition of the domestic rates book published in 2011, there are detailed chapters with chronological rate tables for all four classes of mail including letter, postcard, priority, airmail, parcel post, v-mail, express, periodical, library, free, registered, return receipt, special delivery, insurance and special handling. Also included are chapters on short paid mail, dead letter office return, forwarding, unmailable and nonmailable items, barcodes, permit imprints and the postal savings system. 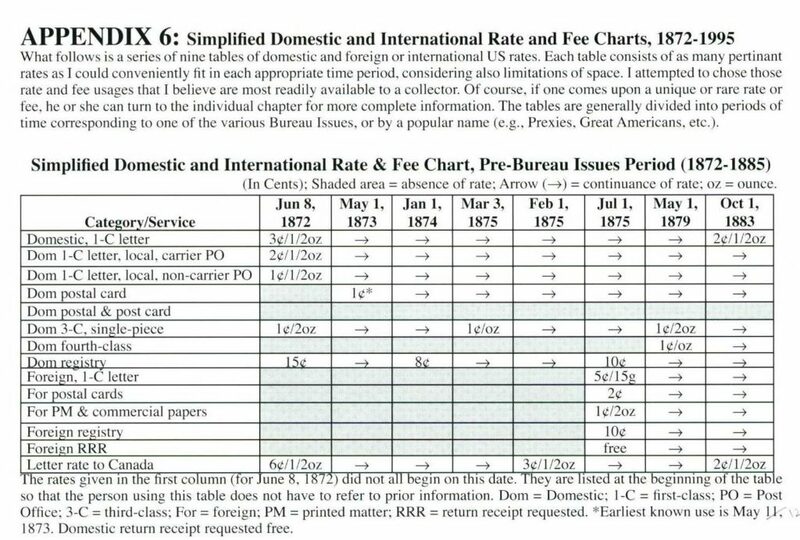 One the most useful sections of the domestic rate book is Appendix 6 titled “Simplified Domestic and International Rate and Fee Charts, 1872-1995.” In it a series of thirteen tables providing rate information for various stamp issue periods is included specifically rates for the periods of Pre-Bureau, First through Fifth Bureau Series, Liberty Series, Prominent American Series and Great American Series covering 1872-1995. Simplified rates are given for all four classes of mail as well as various specialized delivery fees. 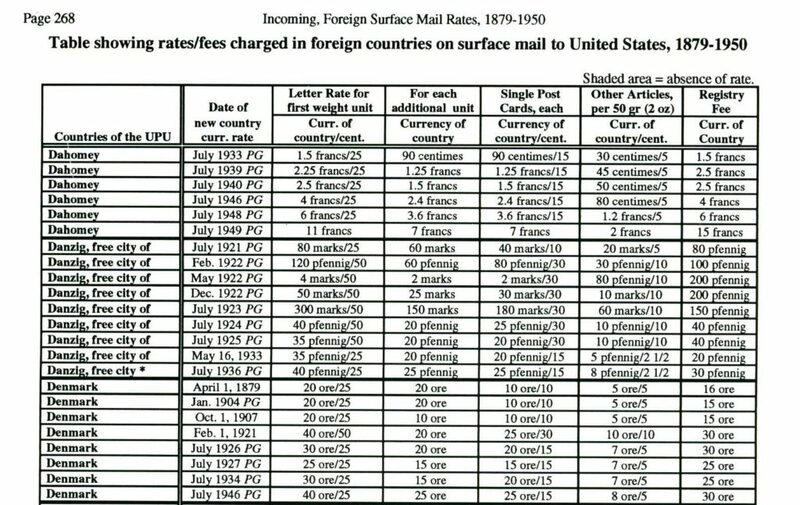 But the real treasure of this international counterpart of the set is found within Chapter 29 where there are 45 pages of tables broken into two subsections titled “Table showing rates/fees charged in foreign countries on surface mail to United States, 1879-1950” and “Table showing rates/fees on incoming surface/airmail to United States, 1950-1971.” Listed alphabetically by country the tables provide basic rate information in the denomination of a given UPU country for letters by first weight unit and additional unit, single post card, other articles by weight unit, and finally registry fee. 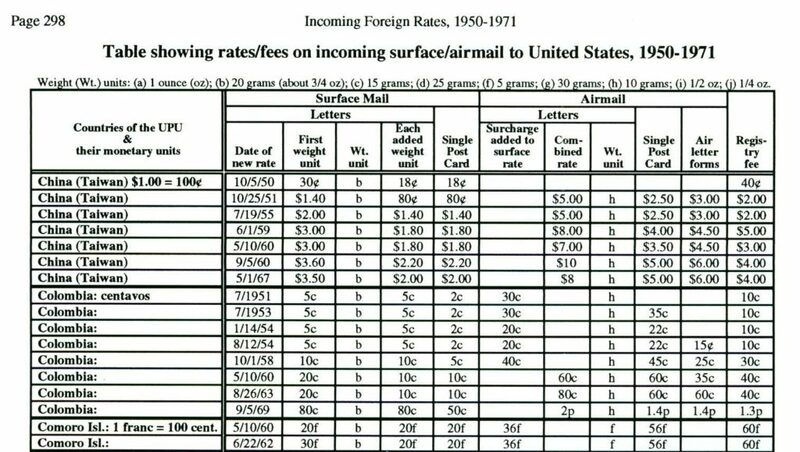 This latter set of tables for rates after 1950 also provides the same information while including airmail rates. For the researcher of international rates to the U.S. this is a first stop for research for basic letter, postcard and registry rates. 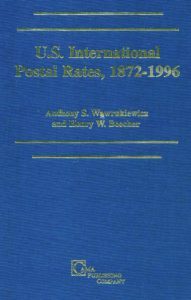 Whether researching historical international or domestic postal rates for the U.S. these two exceptional resources provide an incredible amount of detailed information for the postal historian and rates researcher. Contact the library at library@stamps.org to borrow or research U.S. rate information from either or both of these unique books.